Archive for the ‘How do my children view aging?’ Category. Do I want them to have a negative/denial perspective? “I’m 29!” says the 50-60 year old woman for whom the birthday isn’t exactly happy. 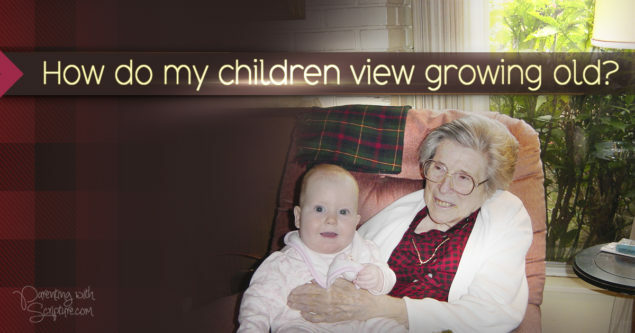 Or, do I want them to have a positive outlook on aging? “I’m not getting old, just older!” says my 83 year old dad. For kids, getting older is fun! It means parties, cake, presents, and privileges. However, it’s helpful for me to remember that they will grow older some day and they are watching my example of how I treat aging. I want to treat each birthday as a celebration of another year gifted with life and gained wisdom! I want that day to be a celebration of what’s positive about growing older, not negative. I want to continue using each year God blesses me with to live my days for His glory! That’s what I want my kids to see! My Great Aunt Christine became homebound in her 80s and decided that since she couldn’t get out, she’d bless others from her home. 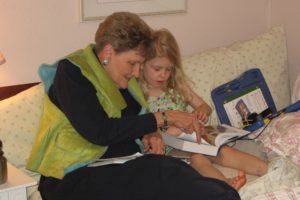 She picked up the church directory and before she got half way through, she had enough women who wanted to join her in weekly Bible readings and discussion at her house. This is a picture of Aunt Chris during that time span, holding baby Kalli. My mom, who despite significant health decline her last year of life and barely being able to breathe because of her rare lung disease, was determined to keep teaching 3rd grade Sunday School and serving weekly at the local food shelter, among other things. She wasn’t about to sit and rock away her days. She was going to give life all she had until she simply couldn’t anymore…and by golly, she did! 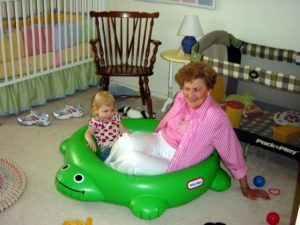 Here’s Mom, showing she’s not too old to have some preschool fun on the floor with her newest grandchild! This is a tough picture for me to see because this was during the year of her decline. She already wasn’t feeling well, but she wasn’t about to let the chance pass to crawl into Kalli’s bed and share her nightly devotional time. Those were the positive examples, however…. Sadly, I also had people in my life who lived completely the opposite way in terms of attitude toward aging and gusto for life in later years. Are they as memorable? Are they people I would want to be like? Did others want to be around them? Unfortunately, no. When I turned 40 a couple of years ago, we had a great drive time family discussion and impromptu Bible study on what God has to say about aging. for each year you give us on this earth. may we head into each new year with the perspective of it being a gift from You. may we give back to You as we seek to glorify You in all we do. On your birthday this year, consider making a teachable moment with your family. Enjoy thinking about the people your family knows that have aged the way you want to emulate and what it is you appreciate about them. As I write this, it’s occurring to me that none of those things have to do with outward beauty. Our society is so caught up in looking young and beautiful no matter the age or cost. But when I stop to think about the older people I admire, it has nothing to do with external. I find them beautiful because of their heart. What a rich birthday dinner discussion this could be! HAPPY BIRTHDAY, to you, whenever yours happens to be! For more teachable moments, refer to your copy of Parenting with Scripture: A Topical Guide for Teachable Moments.